General. The place where the town of Dinant is located has always been a place of strategic importance; therefore it shouldn't be a surprise to know that on the spot of the current citadel, there already used to be a castle in the 11th century. 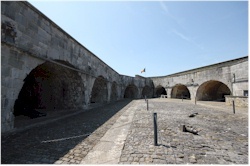 In its present form, the citadel only dates back to 1821, when it was constructed by the Dutch. The citadel can be visited and hosts a museum inside. On top of that, you have a great panoramic view on the town and the Meuse that are located at its feet. History in short. Around 1040, the prince-bishop of Liege built the first castle here to defend Dinant. At that time, the town was located at the border with the rivaling county of Namur. Not by coincidence, around the same time, the burgh of Crèvecour was built by the count of Namur on the opposite side of the Meuse river (in the town of Bouvignes-sur-Meuse). During a long period of time there were regularly skirmishes between both towns. In 1466, the town and the castle of Dinant were destroyed by the troops of Charles the Bold. The castle was rebuilt in the beginning of the 16th century by Everard of the Marck, who was the prince-bishop of Liege at that time. Afterwards, the castle was adapted several times. In 1675, the army of Louis XIV conquered Diinant. The French occupied the town until 1698. 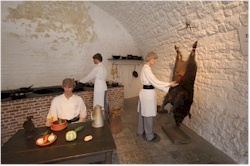 During those years the castle was renovated according to plans of the famous Vauban. When the French left in 1698 however, they dismantled the changes they did to the fortifications. Between 1815 and 1830, the area of what is now Belgium was under rule of the Dutch. Immediately, the Dutch started fortifying their new southern borders and the construction of the citadel of Dinant was part of those efforts. The mighty fortress was built between 1818 and 1821. Its construction follows the natural form of the rock formation, this is why the citadel has the shape of an horseshoe. 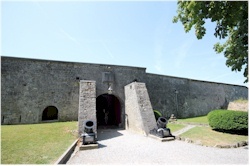 It consists of several covered galleries with firing positions from which canons could cover the Meuse valley. 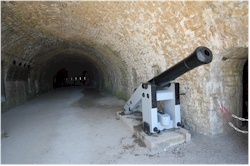 In one of those galleries there were canons installed that were aimed fixed at the bridge so that the bridge could be shot at rapidly if necessary. The fortress was however vulnerable when attacked from the plateau. To protect the fort from that side, a smaller frontal fort was constructed that was separated from the main fortress by a dry moat of about 5 meters deep. The citadel could however become a death trap for its defenders when attacked from that side because the only escape route in the direction of the town were steep stairs that were directly in the line of fire of the enemy. When Belgium became independent, the citadel was taken over by the Belgian army but it did not serve long anymore as an army base. Because the concept of the fort was outdated, the citadel was sold to private owners in 1878. 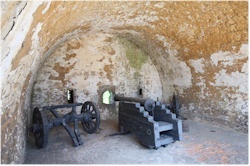 They made the fortress accessible for the public. During both World Wars, German troops were stationed in the citadel. Museum. The citadel is open to the public and it also has a museum. Guides are available. Next to cannons and fortifications you can see the following: the "cachot" (the prison of the barracks), a guillotine and a so-called "fathermurdertable" (that's a table on which the convict had to lay the hand with which he committed the patricide; that hand was then chopped off... before the convict was sent to the guillotine...), the Dutch forge, the kitchen, the bakery, a dormitory, a weapons museum and displays on the history of the fortress itself. 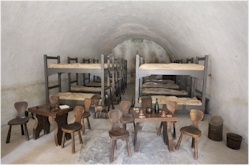 On top of that, a number of rooms are arranged as trenches of the First World War. How to reach the citadel. On the right of the church there is a cableway that transports you to the top of the cliff in no time. But if you are a sporty type, then you can also take the old stairs. From the plateau you can get there by car via the "Chemin de la Citadelle".